European economies levy some of the world’s highest property purchase taxes on prime real estate – UHY’s global study reveals « UHY UZMAN Yeminli Mali Müşavirlik ve Bağımsız Denetim A.Ş. European economies levy some of the highest property purchase taxes in the world on prime real estate, charging on average 4%, or USD 38,356, in tax on a property purchase of USD 1 million, reveals a new study by UHY, a leading international accounting and consultancy network. UHY says that major European economies including France, Germany, and Spain levy among the highest property purchase taxes in the world (see table below). UHY says that although high property taxes are an attractive source of revenue for governments, they could risk discouraging labour market mobility and valuable overseas investment from High Net Worth individuals. 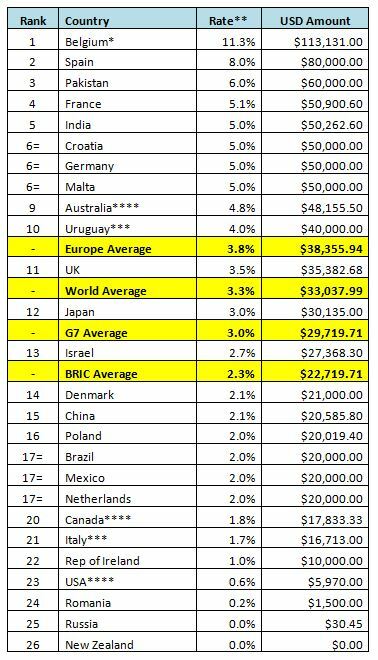 UHY’s findings show that Belgium has the highest average property taxes for real estate worth USD 1 million of any country in the study at 11.3%* – a charge of USD 113,131. Other western European economies at the top of the table include France and Germany, charging USD 50,901 and USD 50,000 respectively on residential property transactions worth USD 1 million. This is far higher than the global average of 3.3% (USD 33,038) for properties in this price bracket. By contrast, many other advanced economies have far lower property purchase tax rates on prime real estate. For instance although the rate can vary across states, the US levies just 0.6% on average (USD 5,970) and Canada charges an average of 1.8% (USD 17,833). Ireland also charges significantly lower taxes than its Western European neighbours at just 1% (USD 10,000). UHY tax professionals studied tax data for individuals purchasing a house worth USD1 million in 26 countries across its international network, including all members of the G7, as well as key emerging economies. UHY says that while the G7 economies charge on average 3%, (USD 29,720) – broadly in line with the global average – tax charges in the BRIC economies are around a third lower at 2.3% (USD 22,720). New Zealand and Russia have the lowest taxes in the table, effectively charging 0% on prime property purchases. New Zealand has no central or local government transaction taxes on real estate and residential property deals between home owners, as they are exempt from the government’s Goods and Services tax. Similarly Russia imposes no transfer taxes on the buyer, who only pays a minor fixed amount of State Duty of around USD 30. UHY points out that in the Netherlands the government reduced the Real Estate Transfer Tax in 2011 from 6% to its current 2% to help stimulate the housing sector for buyers. The lower rate is only applicable to residential property, with the higher 6% remaining for non-residential property. UHY adds that in many countries, including Italy, Spain, and Uruguay, property purchase taxes are calculated using the value of the property in government registries, but these prices can often differ from the market value. * This figure represents an average of the rates in Brussels, Flanders, and Wallonia which can vary from 9.8% to as high as 12.5%.